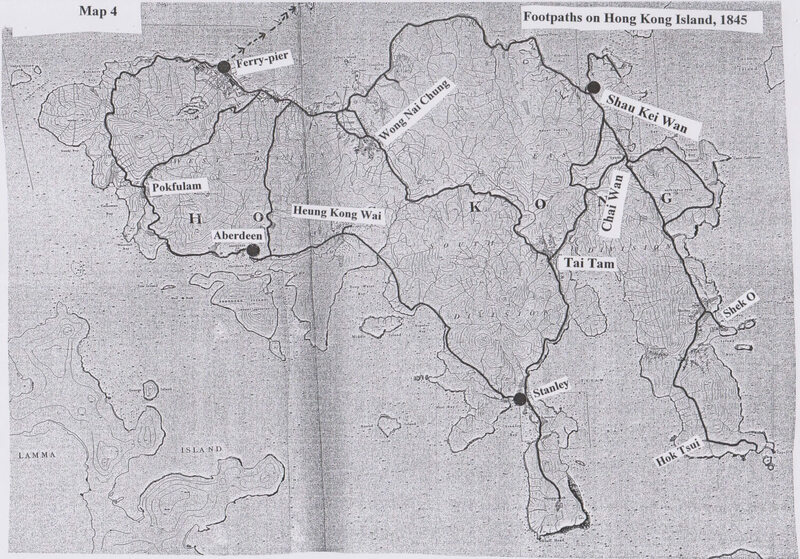 HF: Dr Patrick H Hase has sent a copy of his unpublished paper, Study on Old Trails in Hong Kong: Historical Background, 2011-12, which he has kindly said I can extract parts of and incorporate into articles of interest to the Group. I thought I would start with the section subtitled, Footpaths on Hong Kong Island, which describes the importance of quarrying on Hong Kong Island and in Kowloon when the British took control of the former in 1841. Shau Kei Wan was then, as Patrick describes, a Stone Port and it was from there that stone quarried at many sites was transported to Canton and to other locations in the Pearl River Delta. Stone was immensely heavy, and could not be carried over footpaths for more than a few hundred feet – and even that might require fifty coolies if the block of stone was large. Stone-quarries, therefore, for high-quality stone, to be cut into large blocks for door frames or pillars of major buildings (temples, for instance, major Ancestral Halls, or Government offices) could only function in practice if they were immediately adjacent to the sea-shore, so that the stone could be quarried, and polished, and then immediately loaded onto a boat to carry it away to where it was needed, without the need for any land transport. The most prestigious stone in Canton and the Pearl River Delta area for such quality buildings was Hong Kong granite, which could be given a high polish, and which had a pleasing mottled surface. Hence places where Hong Kong Granite outcrops on the coast were all used for stone-quarries. All such places were within Hong Kong. On Hong Kong Island these Hong Kong Granite areas were Quarry Bay, Shek Tong Tsui (“Stone-quarry Point”), and Hok Tsui at the tip of Cape D’Aguilar; in Kowloon, the Kwun Tong (“Official Quarries”), To Kwa Wan and Hung Hom areas, and Stonecutters Island and Tai Kok Tsui. Boats used for carrying stone had to be specially fitted out, and could not easily be used for other purposes: the port for these special stone-boats was Shau Kei Wan. The Quarry Bay quarries were called “vast” in 1841. In that same year, the Governor’s Chinese Secretary estimated that a hundred stone-boats a month left Shau Kei Wan with full cargoes of stone (up to 70-100 tons per vessel) for Canton and the Pearl River Delta: clearly this was, before the coming of the British, a major trade. This article was first posted on 21st February 2014. Quarries, Four Hills Elementary School, Cha Kwo Ling – Four Kowloon quarries?